Being that One Dish Dinners is such a baby of a website, I thought it would be helpful to those of you looking to make more “one dish dinners” to include a roundup of recipes from $5 Dinners that can be made in just one dish. I hope these fast, simple, and healthful recipes will help you spend less and less time in the kitchen, and less and less money at the grocery store as well! 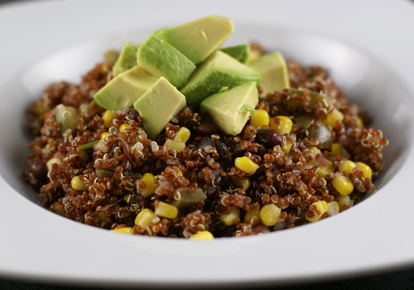 Mmm, I think I’ll be trying the red quinoa with avocado, black beans, and corn next week! It sounds delicious. I want to try that Macaroni Salad for a crowd. Looks like it would be a refreshing dish without too many calories. And if I make it and pretend that it is spring outside, then maybe the warmer weather will follow! The red quinoa, black bean and avocado looks really good, so does the southwest macaroni, I will be putting both of these into my menu next week. Erin ,Thank you for the One Dish Dinner addition. I’m a single senior who still loves to cook. I prepare your full recipes enjoy a portion then freeze the rest for another meal. I think I will try the macaroni salad. I can’t wait to see what else this site will have. sense and are so easy on the clean up! I love your idea about one dish meals,I love to eat and cook but I love it to be in one dish,good food and easy clean up and we have left overs because there are only 2 of us. I do cook you my daughter & her family and make one dish meals,maybe with a salad and bread! Great Idea! I hope I win the book or the $300.00! This is my Birthday month and that would be a great Birthday gift! I have printed the Red Quinoa recipe and plan to make it next week! I have tried Quinoa and it always seems to bland for my husband who loves great tasting food…so I think this will be great! I am going to try the macaroni salad. I’m over heavy foods and ready for lighter dishes! What a great idea for a new website and cookbook! I think I am going to make the Macaroni Salad–YUM! The Slow Cooker Curried Coconut Chicken is a great recipe! I think this website and I are going to have a beautiful friendship. I still like to cook, but I can’t handle a lot of things going on anymore. This looks like the new place for recipes for me! Can’t wait for more one dish dinners!! Oh, and one more thing, I added tuna to the mac salad. Just because. Everyone ate it up!! The Slow Cooker Curried Coconut Chicken sounds fantastic and I am looking forward to trying it. Thanks for the recipe! I’m totally making the Slow Cooker Curried Coconut Chicken tomorrow. Saturday’s a crock pot day because we’re so busy during the day. With the crock pot, I’m not wandering around the kitchen trying to figure out what to fix at 5 o’clock when my husband announces that he’s hungry. I’m going to try the Red Quinoa w/ Avocado, Black Beans and Corn. It looks delicious! I love your websites because they have so much to offer those of us with food allergies that is delicious and affordable for the whole family. Love it! Just got back from Kroger where I bought the ingredients for Chili in bread bowls. A total family favorite here! Thanks Erin! Thanks for the new and innovative recipes, I can’t wait to try them!